IMPROVED DESIGN. NOW SMALLER & LIGHTER. Copper windings and iron generator components for a quality-built machine. Lugged - not soldered - heavy internal leads for better field durability. Superior cooling technology for maximum performance and engine life. Super-tough armour to protect the welder/generator from accidental impact. Lift hook integrated into the centre frame, which bolts to the machine’s base for greater durability. Takes up less space on trucks and trailers - leaving more room on your truck for other equipment and tools. With front panel maintenance displays, you know when your equipment needs to be serviced. Large 45L fuel capacity means many hours of run time before refuelling. MIG, Stick, DC, AC, TIG. Revolutionary ten degree skewed rotor design optimises generator performance. Typical equipment which can be run includes hand tools, circular saw, air compressor and flood lights. 1 X 32 A 240 V 1PH 60Hz. 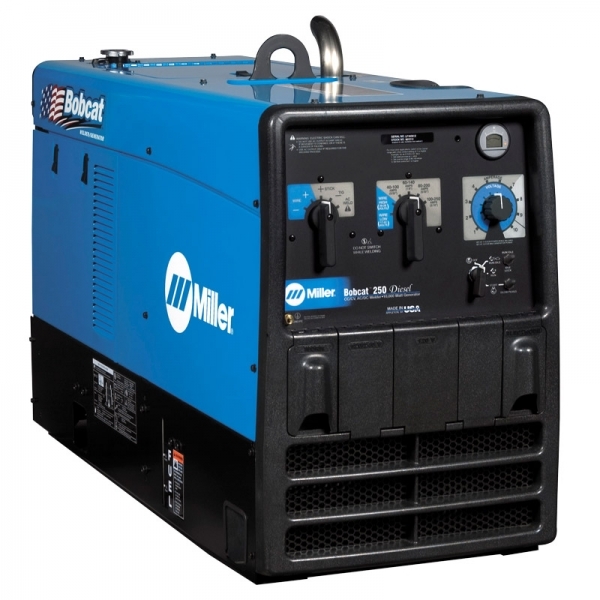 * Generator auxiliary power is 60Hz, and intended for operating equipment associated with welding, such as angle grinders, drills and floodlights. Some Australian 50Hz equipment incorporating induction motors, such as pumps, fans, air compressors, refrigeration or air-conditioners, may not operate correctly and could be damaged. Refer to appliance supplier or manufacturer to confirm suitability.